I recently tried Windows 10 Backup to try and get the file version history integrated into explorer with the bonus of file backup on top of my current backup solution. Set up was fairly easy. Adding the backup location whether it’s a local drive or on the network. It automatically added the folders you’d expect such as documents, music, etc. 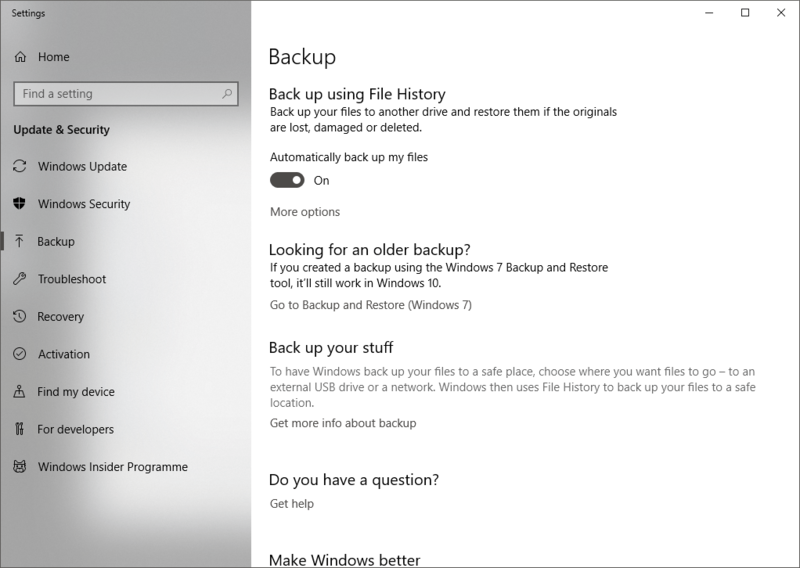 Pressing the “Back up now” button starts the process but there is no visual indicator of how long it’s got or how far the back up has done it’s job. This makes it look like the process hangs with now progress. Turning the computer off and on again has the same state saying the backup has started. There seems to be a lack of notification which was important when I found out using the “See advanced settings” where another window appeared and said it ran out of disk space. Once more space was allocated and running the backup again it started working. An important thing to note is until it has successfully completed it’s first backup, file history doesn’t work even for files that have been backed up. I have set the backup to run every hour and the last run seems to be displayed on the expanded view in Backup or in the advance setting but there doesn’t seem to be an audit log to show each run and whether they were successful or not and it wasn’t something i could quickly find online to see if it was logged in event viewer. The tool needs more work and therefore i cannot recommend this as a sole backup solution. From notification and status of the backup especially when it runs out of space to working out to having a completed first backup. It doesn’t fill me with confidence that I can trust the back up to replace my existing tools. For file history, it works as good as I expected. I wish there was the ability to back up in real time using file on demand or something similar considering OneDrive has a mechanism for hooking into the Windows filesystem to do the synchronisation. I.T software professional always studying and applying the knowledge gained and one way of doing this is to blog. Danny also has participates in a part time project called Energy@Home [http://code.google.com/p/energyathome/] for monitoring energy usage on a premise. Dedicated to I.T since studying pure Information Technology since the age of 16, Danny Tsang working in the field that he has aimed for since leaving school. View all posts by Danny →	This entry was posted in Windows and tagged backup, Disk, sync. Bookmark the permalink.